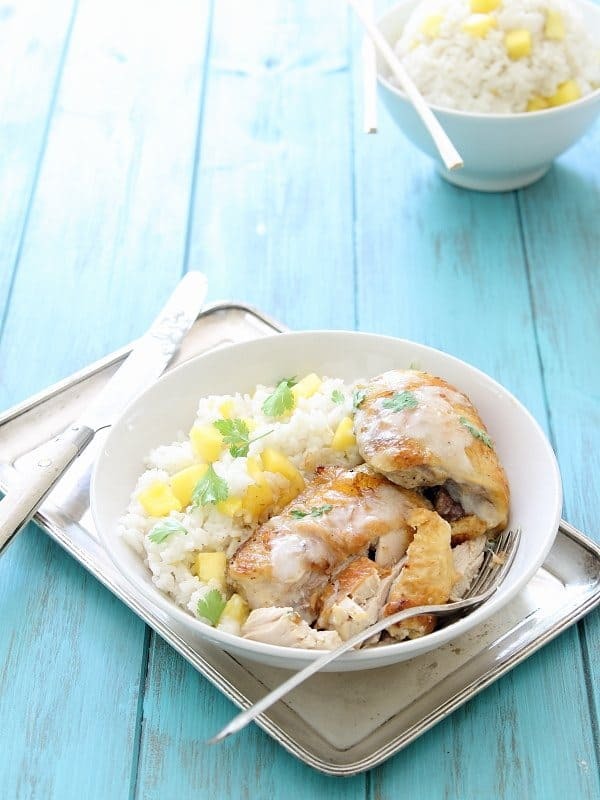 This coconut lime baked chicken is served with coconut infused mango sticky rice for a deliciously crispy, tender and tropical chicken dinner. Having eaten more Cliff bars and beef jerky over the last week than I probably have in my entire life, one thing that makes easing back into real life after vacation a little easier is the fact that at least I have access to real food 24/7 without having to pay some exorbitant tourist price for it. Before we left, I had just found a new place nearby to buy organic chicken at a very reasonable price. I’m not even exaggerating when I say there were at least 6 or 7 packages of bone-in chicken thighs with skin purchased and thrown in the freezer after that discovery and enough crispy fried chicken meals to warrant Ulysses asking if I had just discovered some long lost southern gene. 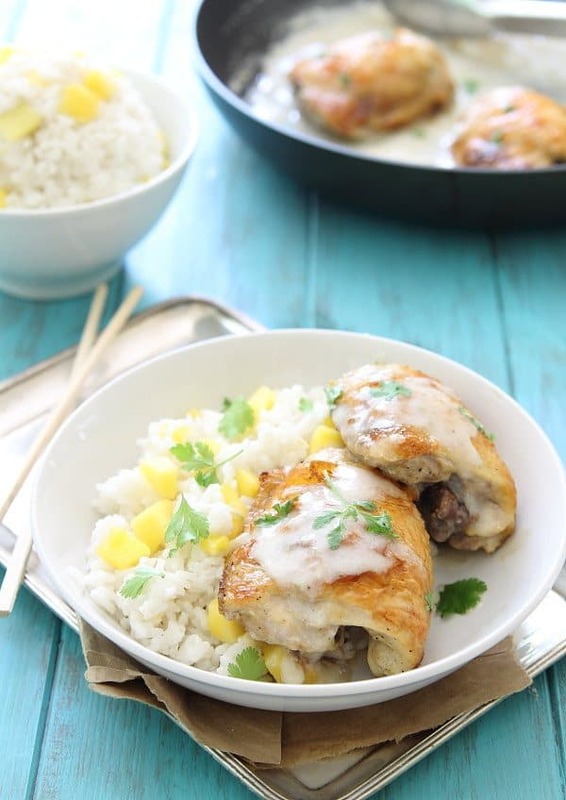 Well, there isn’t any lurking southern gene I know of, but I will say that traditional buttermilk fried chicken was the inspiration for this coconut milk baked chicken with mango sticky rice. 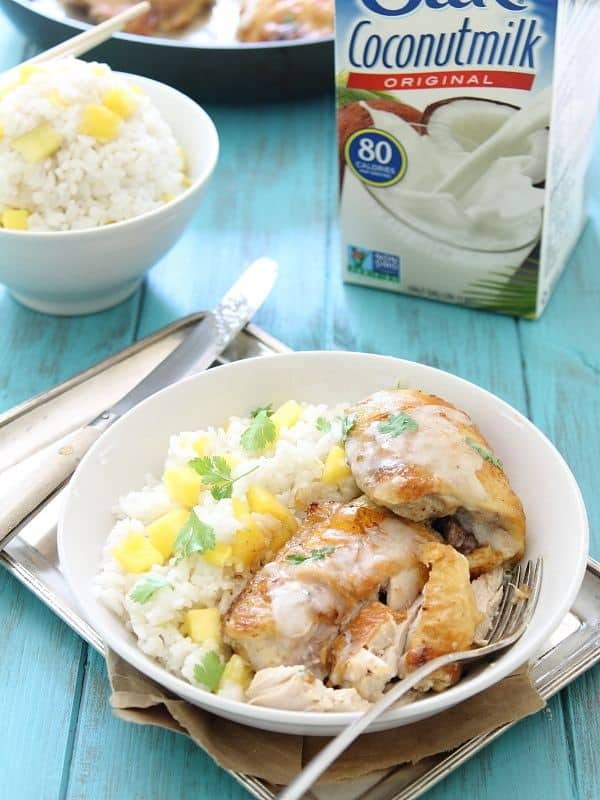 It’s like the traditional southern dish meets its healthier Asian/Thai cousin thanks to Silk Original Coconutmilk. I marinated the chicken in the coconut milk for 36 hours (which only happened because of an impromptu dinner out the night I was supposed to cook it, I don’t ever have the foresight for 36 hour marinades) saving some of the marinade for a creamy lime, ginger and lemongrass infused sauce and the result was some of the moistest and refreshing chicken I’ve ever eaten. Served over sweet mango sticky rice (my newest starch obsession) cooked with coconut milk as well, it’s pretty much a savory Thai explosion that beats Cliff bars and jerky a million times over. My backyard view of dandelion ridden grass and the neighbor’s pool might not compare to the cliffs of Zion national park, but at least I have this faux-fried chicken. If you love the flavors of coconut and lime (like me) and want to try some dessert variations on that combination, check out this key lime coconut panna cotta or this coconut lime ice cream float. For more chicken recipes like this coconut lime chicken, try Sticky Thai Chicken, Sweet and Spicy Indian Chicken or, Sriracha Lime Chicken Skillet. Whisk together the coconut milk, ginger, lemon grass paste, lime zest, lime juice, salt and pepper in a large bowl. Pour 1 cup of the marinade into a separate container, seal and refrigerate (this will be used later for the sauce). Place the chicken in the bowl with the remaining marinade. Toss to coat and submerge the chicken in the mixture as much as possible. Cover and marinade for at least 2 hours up to overnight. Remove the chicken from the marinade, place on a baking sheet. Heat the oven to 450 degrees and cook chicken for 20-25 minutes until golden brown and crispy. While chicken cooks, pour the reserved marinade into a medium skillet over medium heat. Whisk the cornstarch together with about 2 tablespoons of water until dissolved. Add the cornstarch slurry to the skillet and whisk continuously until the mixture comes to a simmer and starts to the thicken. Once thickened, turn off heat and set aside. Combine the rice, coconut milk and water in a small sauce pot. Bring to a boil then reduce to low and cook covered until the liquid is fully absorbed by the rice. Remove from the heat, add the chopped mango and stir to combine. Serve the chicken with the rice and top with the sauce. I am glad you had a good vacay! The pictures on IG looked incredible! I seriously am obsessed with this chicken. I am on a coconut lime kick, and I just discovered that I LOVE mango (didn’t like it before) This is happening. Pinning! I’m coming over for dinner, my friend!